The camp site, situated by a crystal clear brook, is part of a former water mill. There are 55 camping pitches, of different sizes. Apart from the pitches situated by the border of the brook, there are also a range of terraces. These terraces are nicely private due to the wide green belts in between them. The entire property, in harmony with the surroundings, was formerly part of the rural _Chaules_ estate. The ruins of the old castle, owned by our neighbour, rise high above the trees and can be visited (at your own risk since parts are a little unstable). During the high-season period (July / August) the camp site is very family oriented with a wide range of facilities for all ages. Out of season, the camp site is very popular with people who prefer a quiet, spacious site with lots of opportunities for walking, excursions, etc. Spacious mobile-home with 2 separate bedrooms; one with double bed. Several cupboards provide sufficient storage capacity. Sitting area (possibility to unfold another double bed) and kitchen with cold and hot water supply, fridge and complete service for 6 persons. Bathroom with toilet, shower and washbasin. These comfortable mobile-homes are excellent for the periods outside the high season; electric heating is available and inclusive. Spacious safari lodge with 2 separate bedrooms; one with double bed. Several cupboards provide sufficient storage capacity. Sitting area (possibility to unfold another double bed) and kitchen with cold and hot water supply, fridge and complete service for 6 persons. Bathroom with toilet, shower and washbasin. These comfortable mobile-homes are excellent for the periods outside the high season; electric heating is available and inclusive. 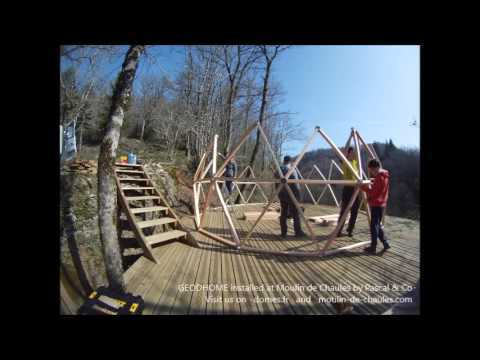 Our geodesic dome nestles among the trees on a large wooden terace supported on piles. This unusual spherical dwelling is made from wood and canvas. The surface area of the dome is 30 sq metres. From the living space, the double bed room and the kitchen, one has a panoramic view of the mountains and the stream, the childrens’ sleeping area is closed off. The dome is situated within <30 metres of the campsite sanitary block. Ours wooden cottage offer all the comfort for the beautiful holidays A great view on the nature with a panoramic window of 4 meters of large. A nice space and a nice fitted kitchen with a dishwacher open on the big terrace. 2 Bedrooms one for the parents (king-size bed 160*200) one for the children (2 single beds and 1 bunk bed). A bathroom with a big shower and a separate toilet A good isolation and heatings for the begin of the spring and the eind of the autumn. A modern design with good materials perfectly integrate in our campsite.